If you are in the Nashville or surrounding areas, you are in for a treat! 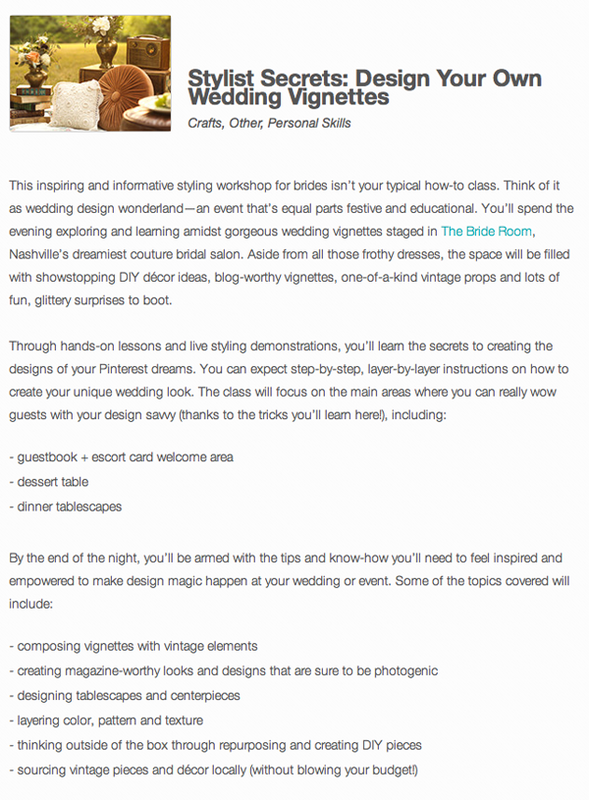 The Skillery is presenting a new class, Stylist Secrets: Design Your Own Wedding Vignettes on September 17th! The class will be taught by the amazing Elizabeth Ulrich, who founded Stockroom Vintage. Below is a sneak peek at what all you will learn at the class but definitely check out the event site to learn more & register! Incorporating Summer Trends into Your Wedding-NEON! I love staying on top of trends and seeing what’s new but what’s important is to not overdo it. Neon has made a big return this summer and I think it’s quite fun. I would advise not spending a lot of money though on trendy items since they come and go so fast. I think it’s easiest to stick with accessories if you’re going to buy something trendy. Below are just a few ways you can incorporate some fun colorful pieces into your wedding, whether it’s for the bride, bridesmaids or a guest. Bronzer is a summer must have to give you that sun-kissed glow, without the risk of sunburn! Here’s some info on how to choose the correct one for you. In general, you want to stay away from sparkly bronzers. The sparkles can quickly give off a metallic sheen that appears greasy, not fresh. Also unless you are 14, glitter is better left on your kid’s art projects, not your face. Look for shades that are peachy or pink if you are fair skinned. Richer browns can be a little too strong and since the goal is a gentle whisper of sunlight across your face, darker tones can overwhelm a fair face. But if you are medium to dark skinned, earthy colors can really warm up your face. There are several different formulas available to try as well. Most of us are used to using powder bronzer, which is applied with a large fluffy brush. Swipe across the tops of cheeks, forehead and down the nose for a soft glow. Try Tarte Matte Waterproof Bronzer in Park Avenue Princess. Mineral bronzers are applied like any other powder bronzer, but I had to mention one all star. Smashbox Halo Hydrating Perfecting Bronzer. Beautiful on any skin tone and gives a truely healthy radiance. Creamy sticks can be applied anywhere on the face and are easy to blend into naked skin or foundation. Use a cheek brush or your fingers to buff into the skin. Try NARS Multiple Bronzer in Cap Vert for a matte finish. Liquid bronzers are best applied slowly, as a little tends to go a long way. The also leave a dewy finish. A drop or two on your fingertips should take care of your entire face. Try Josie Maran Argan Bronzing Oil. Add a little blush to the apples of your cheeks, after your bronzer, to give a gentle pop of color. Amy Lynn Larwig – 2 Minute Tutorial – Natural Warmth from Mark Brown on Vimeo. 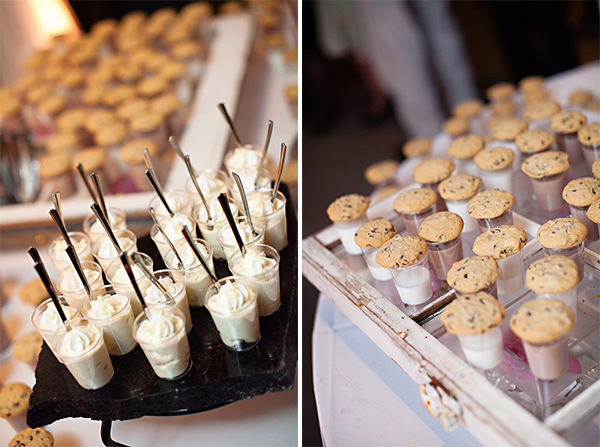 One of the biggest wedding expenditures (and often the one most enjoyed by your wedding guests) is the food. It’s been a long-standing tradition to serve a meal as part of a wedding reception and these days couples are getting creative and choosing menus that reflect not only the reception time of day, but the location, region, and their cultures and personalities. You can serve pretty much anything at your reception, as long as it’s tasty, filling, and reflects the formality of the party (meaning you wouldn’t serve casual BBQ at a black tie affair). What are some things to consider when creating your reception menu? First you must decide if you (and your guests) would prefer a plated meal (in which all guests are served a plated dinner at their tables), a buffet, action-stations (similar to a buffet but instead of one area where all the food is presented, the food is set up at various stations throughout the room), or some combination of all styles. You should also consider whether you’d like to serve appetizers during the cocktail hour (these can be passed or set up at a station), any type of dessert other than wedding cake, and finally if you’ll serve any additional snacks or treats at the end of the night. Next, brainstorm different foods that you like as a couple and that your family and friends might enjoy and feel free to get creative! You don’t have to service the traditional beef or chicken with veggies and potatoes. The sky is the limit. You can incorporate any ethnicity or region in your menu, Italian, Asian, French, southern or mix it up for variety. At a recent catering meeting with a couple, they decided to each choose an appetizer that represents their heritage and background. For the groom from New Orleans, Cajun Shrimp Gumbo Shooters and for the Asian bride, Mini Pork Eggrolls. And who says you can’t serve more casual favorites dressed up a bit? A recent couple we worked with served the most amazing gourmet Gouda Mac & Cheese as a side dish in their wedding menu. Create a budget of what you plan to spend on your catering menu. Keep in mind the more options you serve, the more it will cost. Prices vary by region but in Nashville you can expect pricing to start around $20 per person (for a very basic meal with no appetizers) and range up to $70 per person or more. Typically I find our couples spend an average of about $30 – $50 per person on the food. This per person cost does not include a 20% service charge or 9.25% state sales tax. Also decide whether this budget includes the rental of service ware, silverware, and glassware or if that is provided elsewhere (through the venue or renting from an event rental company). Finally research various caterers in the area and ask people you know for recommendations. Typically if a company has been in business for many years and does a lot of events, they most likely do a great job. Keep in mind that you will most likely not be able to taste any food before placing a deposit (yes, this is a pain but consider that a catering company can’t give a free meal to EVERY person that is considering hiring them). So be sure to do your homework, read any reviews you can find, and ask for recommendations. If you hire a wedding planner, they will be able to recommend catering vendors that are reputable and fit with your budget and style. A final bit of advice…keep in mind this is a wedding, not Thanksgiving dinner. You do not need to serve a Smorgosbord (yes I had to look up how to spell it) of food with tons of different choices and a million sides, just to please everyone. It’s just one meal that you are hosting with a set menu. Choose 1-2 meat options and 2-3 sides, plus 3-5 appetizers. Don’t worry if not everyone will like everything, if you’ve got picky eaters, that’s their problem, not yours. Good luck in planning a tasty wedding menu! 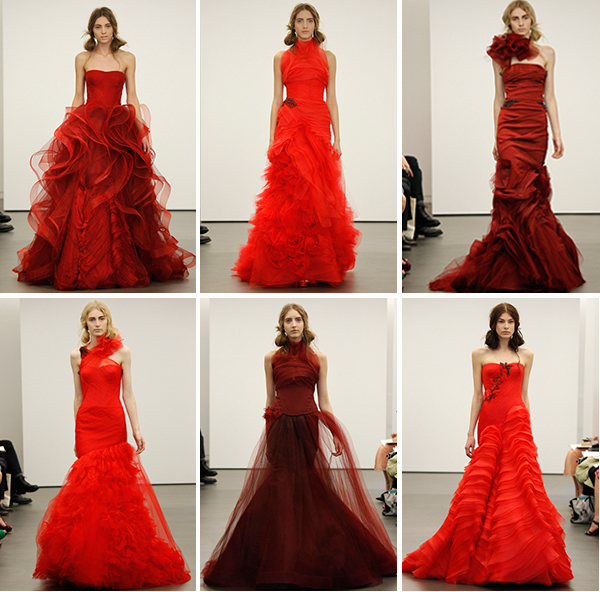 Everyone was a buzz over Vera Wang’s Spring 2013 Bridal Collection, and with good reason. Dresses with luxurious amounts of tulle, big ball skirts with over sized hand rolled flowers, and scarlet jewels all made their way down the runway. And then of course there’s the color. Vera describes it as “boldly romantic, charming, protective and in celebration of love.” I hope this is a trend that’s here to stay, I love seeing wedding gowns in all different colors and hope brides embrace it as well. I can’t wait to see her next collection!